Nicholas Co. is a diversified commercial real estate firm providing brokerage, development, expert consulting, real property appraisal and property tax consulting services to corporate and private clients. We are results-focused—achieving a high degree of success in meeting our client’s goals and objectives. Our clients receive the benefits of expert knowledge, maximum effort, trustworthiness and dependable professional representation. 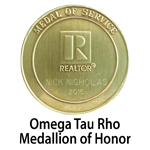 If you need professional real estate assistance, contact nick@nicholasco.com today for a no-obligation professional consultation.